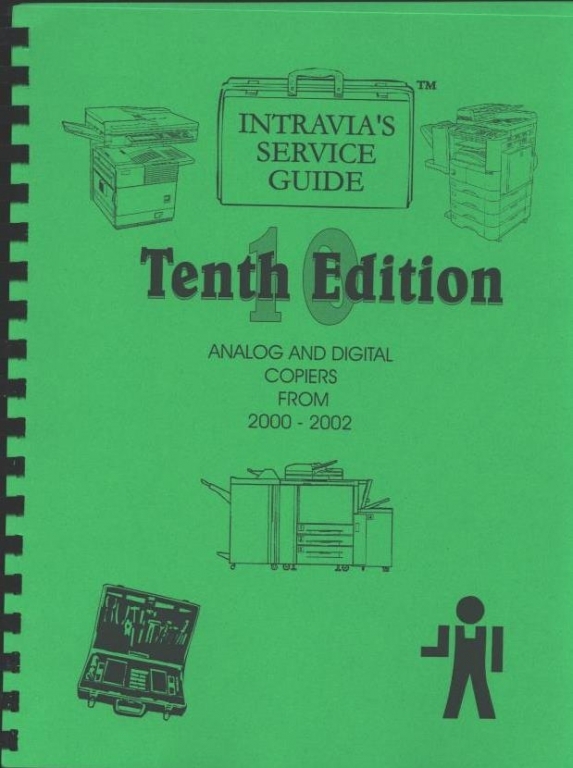 These manuals were developed mainly for use by copier technicians, although an end user with some technical ability will find them helpful in servicing his copier. These manuals do not show how to service or take apart any of the machines listed. These manuals do contain error codes, simulations, diagnostics, adjustments, maintenance counter procedures, and switch settings. If you are a beginner, you should at least purchase "The Imaging Guide to Xerographic Equipment" to learn the basics. There is a 15% restocking fee for any book that is returned. 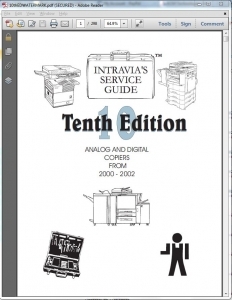 Intravia's 10th edition copier service guide, in PDF format, delivered by email within 24 hours. Free shipping. Covers Canon IC-D620, IC-D660, IC-D661, IC-D680, IC-D681, IR1200, IR1300 series, IR1600, IR2000, IR2010F, IR2200, IR2800, IR3250, IR3300, PC1060, PC1061, PC1080F Gestetner 2651, 2760, 2770, 2913Z, 3222, 3227, 3355, 3370, 3502, P, 4502, P Hitachi I45, I55 Imagistics DL155, DL185, DL200, DL270, DL370, DL460, DL550, DL750, DL3510, DL4510 Konica 7025, 7035, 7055, 7065, 7075, 7115, 7118, 7415 Kyocera-Mita 1505, 1510, 1530, 1810, 2030, 2530, 3030, 3530, 4030, 4230, 4530, 5230, 5530, 6230, VI7360 Lanier 5222, 5227, 5415, 5455, 5635, 5645 Minolta Di151, F, Di152, Di183, Di200, F, Di251, F, Di351, F, Di450, Di550, Di75 Muratec 2530 Mita DC-5090 NEC IT2510, IT3510 Oce Op33, 3275 Panasonic DP-130 series, DP-150 series, DP-355, DP-455, DP-605, DP-1510, DP-1810, DP-2000, DP-2010, DP-2500, DP-3000 Pitney Bowes DL155, DL185, DL200, DL270, DL370, DL460, DL550, DL750, DL3510, DL4510 Ricoh Afico 220, Aficio 270, Aficio 551, Afico 700, Afico 1035, Afico 1045, 3813, 7650, 7660, 7670 Royal Copystar 1505, 1510, 1530, 1810, 2030, 2250, 2530, 3030, 3530, 4030, 4230, 4530, 5230, 5530, 6230 Savin 2013Z, 2055D, 2070DP, 2535, P, 2545, P, 9500, 9600, 9700, 9922DP, 9927DP Sharp AL-1215, AL-1340, AL-1451, AL-1530CS, AL-1540CS, AL-1551, AL-1551CS, AR-122, AR-123E, AR-152E, AR-153E, AR-157E, AR-235, AR-275, AR-M350, AR-M450, AR-651, AR-810 Toshiba eSTUDIO 16, eSTUDIO 20, eSTUDIO 25, eSTUDIO 28 (DP-2800,) eSTUDIO 35 (DP-3500,) eSTUDIO 45 (DP-4500,) eSTUDIO 120, eSTUDIO 150, eSTUDIO 550, eSTUDIO 650, eSTUDIO 800 Xerox® WorkCentre Pro15, WorkCentre Pro16, XL2120, XL2130, XL2140DF, Pro416, Pro 421, DC332, 340ST, 425, 432, 440ST.